Following a meeting of experts at the Landscape Matters Conference in Nidderdale earlier this month it was highlighted that funding for schemes, such as the Heritage Lottery funded Upper Nidderdale Landscape Partnership, will end this year. It is difficult situation for organisations, with the uncertainty around farming post-Brexit, rural isolation and still ensuring opportunities are created for young people to take part in the rural economy. Paul Burgees, Manager of Nidderdale AONB said: The Landscape Matters conference shared crucial learning from the four year landscape partnership scheme. 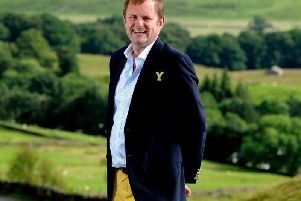 It was also suggested that landowners and farmers could look to additional business opportunities, with traditional building, drystone walling and hay meadows. Julian Glover, who was commissioned by the government to review how England's protected landscapes will be fit for the future, also attended the conference and pointed to the work done by landowners, farmers and volunteers. Thanks to the work of the Upper Nidderdale Landscape Partnership school children have been trained in heritage skills, farmers helped to increase biodiversity on their land, and conservation work carried out on flagship heritage sites. To see this kind of work continue will require the support of the community, says Louise Brown, Scheme Manager for the Upper Nidderdale Landscape Partnership. Despite the end of the funding there is optimism that residents will continue to back work which helps protect the countryside.